There are several different versions of this story. I will share the version I was told by a wise man many years ago. That is right. If there is only one crab in a bucket it WILL escape and live a long happy life. 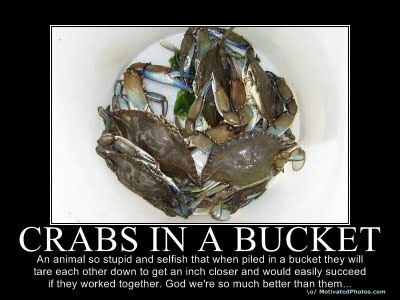 If there are two crabs they will both die in that bucket together. This is a true story of a hard but valuable life lesson I learned early on in my life. I grew up rough and poor. Can you say welfare and housing projects? It was different 30 years ago. No discreet EBT debit cards like they have today. Back then you had to use the good old food stamp coupons and your free lunch ticket. Back then being poor meant steady degradation and humiliation. I vividly recall seeing a girl from school I had a crush on at the grocery store one day. I smiled really big and waved. I also recall the disapproving look on her and her mother’s face when I paid for the milk and bread with food stamps. It meant having to dread every Monday morning before school in the cafeteria. This lady would walk out with this box and notebook and scream out “FREE LUNCH TICKETS LINE UP!” Then you had to get up, in front of all of your classmates, and wait in line to get this little paper card that you had to keep up with all week. If you lost it you didn’t eat. Some of your classmates would just stare, some would laugh. I remember getting a brand new pair of jeans which was a rare occasion back then. I couldn’t wait to get to school so the other kids would see and be amazed at my new jeans. I was in such a hurry that first morning I RAN so that I would get to school faster. About a block from my front door, I tripped on the sidewalk and completely tore holes in both knees. In less than 30 minutes my new jeans were covered in blood and the knees completely torn out. I cried the rest of the long walk to school. When I saw my friends from the neighborhood I was afraid they were going to make fun of me because I had been crying. They didn’t say a word. They looked down at my blood stained jeans with the holes and they knew. My friends patted me on the back and reassured me that it would be alright. They knew and I knew that I wouldn’t get another pair of jeans for a very long time. These were the same friends that shared their lunches with me when I lost my free lunch card. We knew even at a young age that we were all in the same situation. We always talked about our plans for the future and how things were going to be different when we grew up and escaped to live our dreams. I left my neighborhood eventually. I began my career as a personal trainer and never looked back. When I was 21, I owned a small gym and was living the dream I had only talked about as a kid in that awful neighborhood. I wasn’t rich or famous but I was proud of myself. One day, after a long absence, I decided to go visit my old neighborhood. I drove up in my new truck and went to my old hangouts. I was excited to catch up with all my old friends. I just knew they were going to be so proud of me and excited to see me. I had this misguided illusion that I was the great success story of my neighborhood. Instead I was told how I had “sold out” and how I thought I was “too good” to still live in the same place. I was met with disdain and hostility from the same people who shared their lunch with me and patted me on the back when I ripped my brand new jeans. I was confused and hurt. A small part of me actually felt bad that I was no longer a poor kid from the neighborhood. It was like ripping my brand new jeans all over again. I drove the eight-hour drive home angry and sad at the same time. That was in 1994. I have never returned to my hometown since that day. Soon after I was told the story of the crabs in the bucket and it all came together. I was the crab that escaped the bucket. People who improve,move forward and live their dreams. People who just get older. If you are reading this I know that burning fat, losing inches and improving your life is your goal right now. I always have new people, just like you, who decide that they are going to lose those last 10 pounds, burn that stubborn body fat and kiss the fast food and sodas goodbye forever. I love the pure excitement and energy of helping someone take that power and control of their lives and health. I hope I am fortunate enough to be chosen to help you reach those goals in the gym and in your life. When you turn down that lunch time buffet and eat your grilled chicken and vegetables instead you are going to get some grumbling from your friends. When you turn down the after work happy hour drink invitations to go to the gym, people will eventually stop calling you. When you turn down that birthday cake or other bad food at the office your coworkers are going to give you grief. Your spouse and kids are likely going to complain about not going out to eat as much or how much time you spend at the gym. They will say you are obsessed or selfish. That you think you are “too good” to eat their food. They are going to tell you that just one isn’t going to hurt you. They are going to make you feel guilty because you would rather work out at the gym than spend time with them. These are the crabs in your life and you must be prepared. They are very often your friends and coworkers. Possibly even your spouse and family. Don’t worry. Don’t beat yourself up. You are just the crab climbing out of the bucket. 1. Be patient with the other crabs. They are not bad people. They only try to pull you back down because they fear that if you escape the bucket they will lose you forever. 2. Always keep your goal or dream in mind. 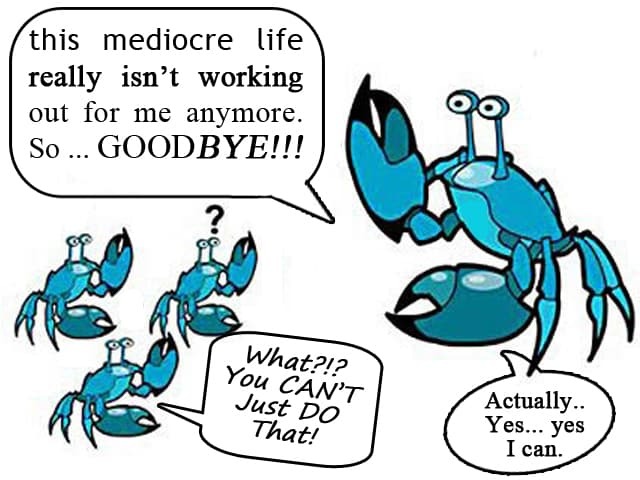 Staying focused and determined guarantees that you will be the crab that escapes the bucket. 3. Once you make it out of that bucket, never ever get back in the bucket. 4. Most importantly, make sure when you see a crab climbing out of the bucket that you push them on over the edge and not drag them back down. Wow B’…I was going to skip my lunch workout today but not after reading this! 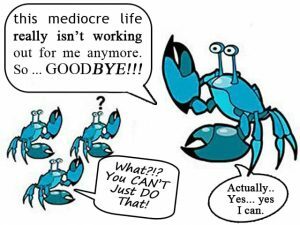 I decided to be that one lonely CRAB and just DO IT! I got it DONE! !